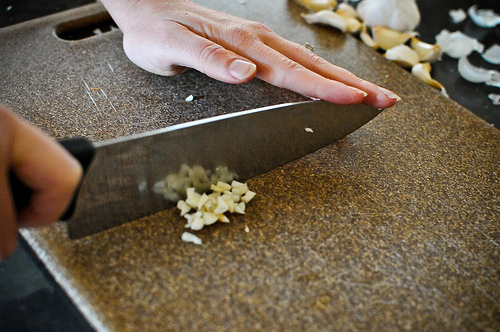 How to chop garlic quickly & easily – and remove the smell from your hands! 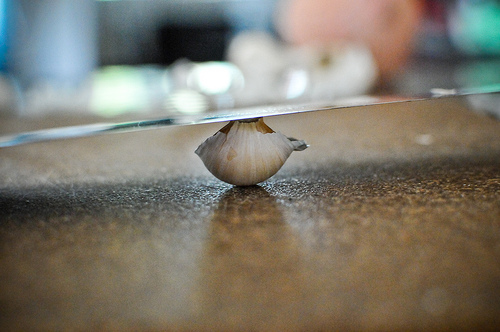 I love garlic, so I tend to go through a lot of it. 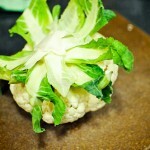 Which is great, because it’s really good for you and most people seem to like the flavor. 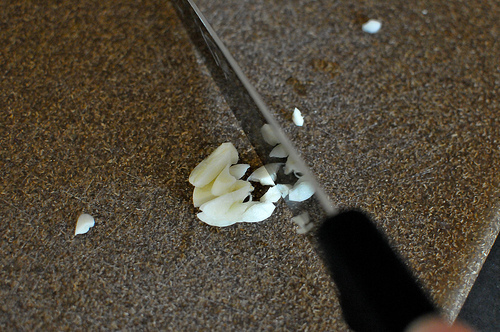 The downside being that if you don’t know how to chop it quickly, those little cloves can be a real pain in the behind. 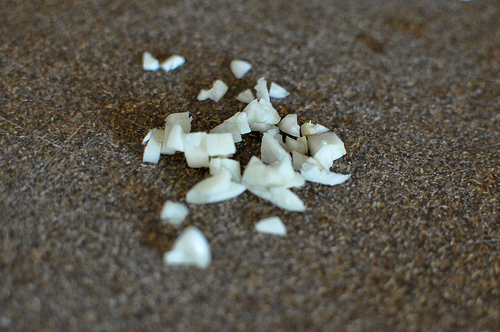 So I shall now share my technique for chopping garlic – it’s nothing terribly exciting but it does make chopping up a bunch of cloves of garlic a less painful experience. 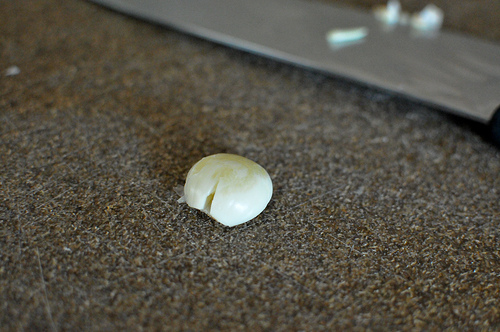 Peel off all the papery skin and break all of the cloves off. 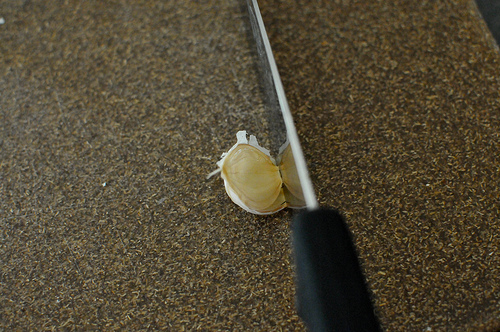 If they are being stubborn you can lay the flat side of your knife on the top of the bulb and press on it, that should loosen them up. 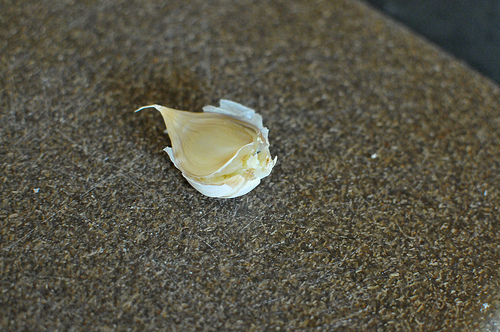 Once you’re done you should have a bunch of individual cloves of garlic. You can now keep the ones you don’t need in a small dish or garlic container, ready to easily grab next time you need a couple. 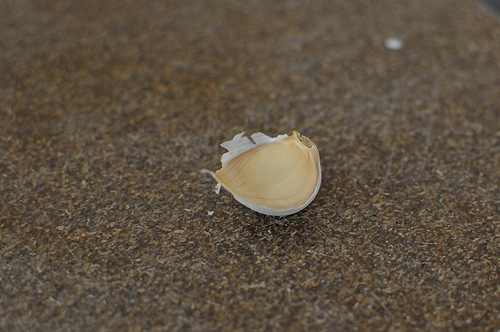 Now just cut off the little hard stumpy end and the rest of the skin should peel off really easily. 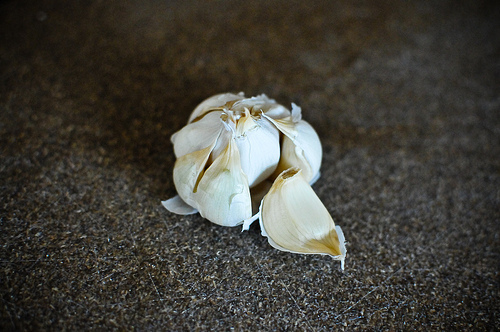 You’ll be left with a little naked clove of garlic, ready to chop. 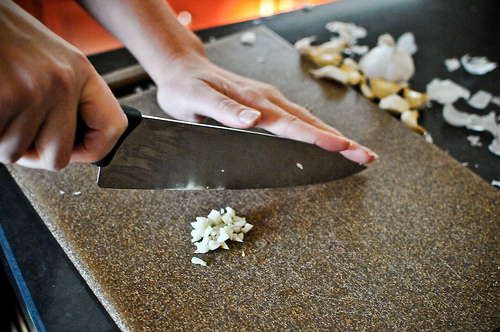 Start by cutting it from top to bottom, along the long side of the clove. 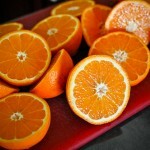 Then you’ll have a bunch of slivers – rotate them 90 degrees and chop them into small pieces. 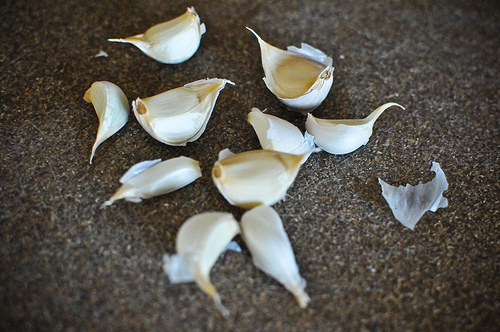 If you are chopping multiple cloves of garlic I recommend peeling them all and cutting all of them lengthwise, then grouping the slivers into a pile and cutting all of them widthwise – just makes it go faster than doing one piece at a time. 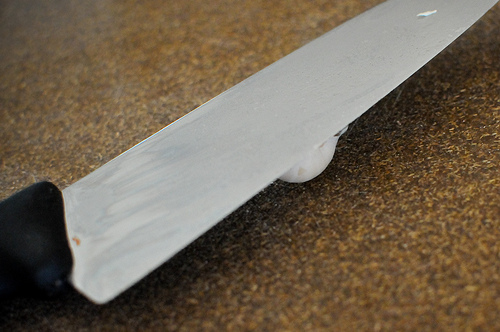 Now just chop in a rocking motion from one side to the other and back again. 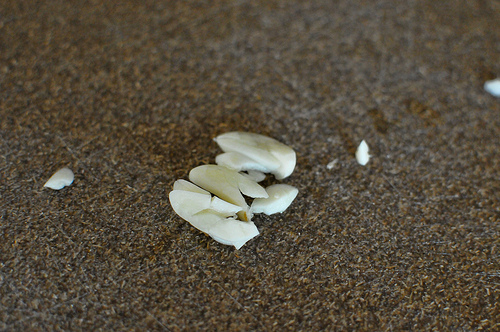 You may have to occasionally scrape the garlic back into a tight pile, it’ll want to spread out and annoy you. 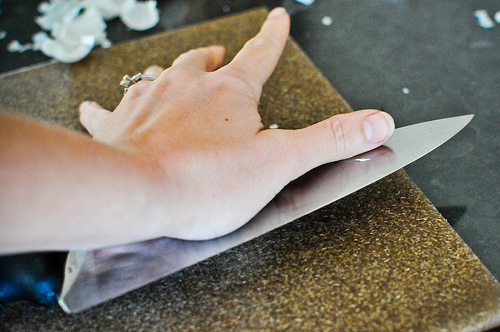 But just show it who’s boss and scrape it back in with the side of the knife. 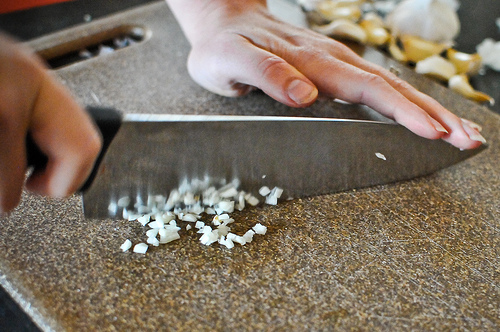 That’s all there is to it – just keep chopping away until it’s as fine as you want it. 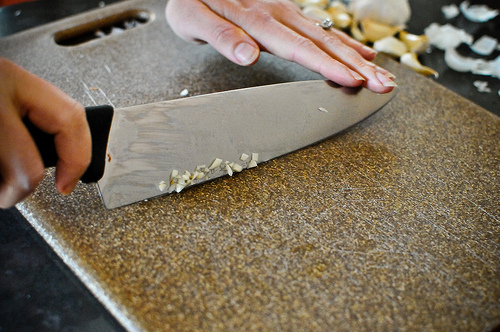 With a bit of practice this part goes really fast and you get to do that super fast chopping action that makes you (and by you, I mean me) feel all professional and knife-skillsy. 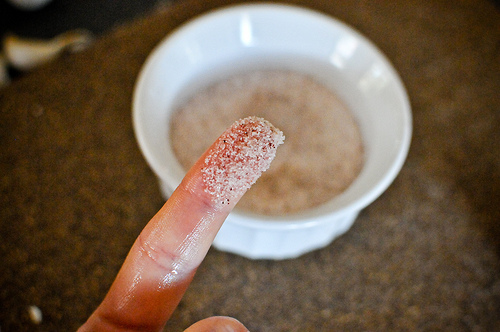 Scrub the salt around between your fingers a bit, then rinse it off. Voila! 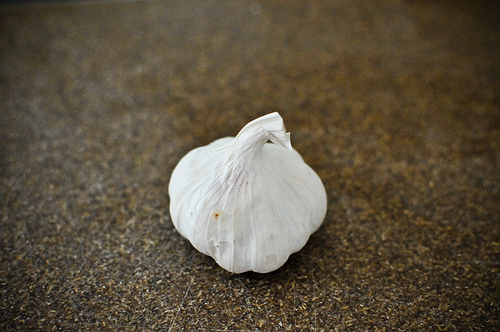 No more garlic smell! 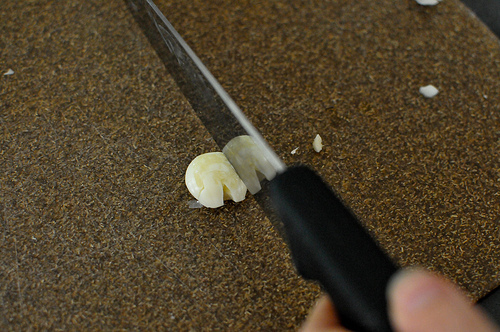 That’s my standard technique – usually takes me about 30-60 seconds to chop around 3 or 4 cloves of garlic, which isn’t too bad. Anyone else have an even faster way to do it or some other gadget that makes it even easier? I’d love to hear about it! 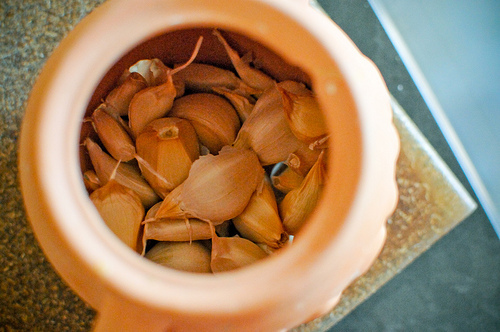 My friend has this little rubber cylinder that you put the garlic cloves into, you roll it on the counter once or twice, and your garlic clove is peeled! No more nice-squishing! I’ll have to ask her what it is called, but man is that thing cool! 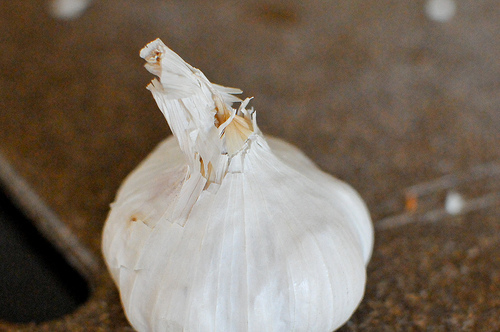 The tip for how to remove garlic odor from your hands is genius. Thanks!